I’ve decided to call this jacket I’m working on “The Yeti”. I’m following the Copenhagen Jacket pattern from Naturally Caron. 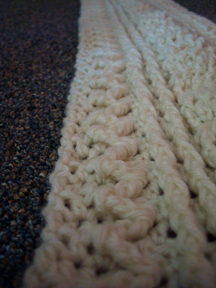 I realized that the 100% acrylic white yarn that I’m using (because I have lots and lots of it) is not going to drape like the picture in the pattern. In fact it’s going to look rather bulky when I’m done because this particular acrylic yarn I have is kind of stiff, because it’s kind of vintage. I think they make acrylic yarn a bit softer now. So. I thought might look like a yeti while wearing it, all white and bulky. Which would be nice in the winter. I’m quite pleased with the prospect of looking like a yeti in the winter, with all that snow (if there’s going to be snow…). So, anyway, the jacket is made up of 2 long panels and 1 short panel, plus the collar. 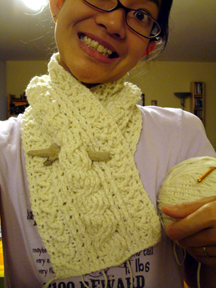 So far I’ve done the first panel and it occurs to me that it would make a rather nice cowl. Like an Irish fisherman sweater, but a cowl. 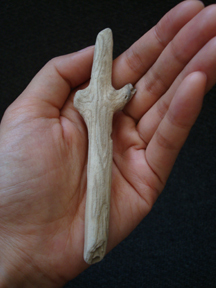 I took a closer picture of the drift wood, because I think it’s quite beautiful in itself. For a moment I debated whether I should stop and just let it be a cowl. But I thought about the yeti… and decided that I will finish the entire jacket. It’s going to be a bit of a long project, but it doesn’t feel like it’s taking as long as it is actually taking because of the fun crochet cable pattern. And as always (well, not always, but often enough), my gauge is completely off. I think the yarn I’m using is a bit thinner than the one called for, even though it says “worsted” on the label and the pattern also calls for worsted weight yarn. So I switched to a larger hook and also followed the instruction for a medium/large size (i.e. adding extra dc rows to the long sides) to match the dimensions in the pattern diagram. But the construction of it is rather straightforward so I’m sure it will all work out.